It is said that imitation is the sincerest form of flattery, and within the world of fashion, this statement is evidently true. In a fashion history retrospect, you can observe imitations and garments that give homage to past eras and societies often with the ability to track an individual garment to its origin and beyond. It was Sociologist, Georg Simmel (1904), strongly influenced by Economist and Sociologist, Thorstein Veblen, who sought to explain that class structures played an important part in fashion. Analysed via the newest fashion movement theory ‘The Trickle Theory’, coined by Veblen in 1899, we can start to see a trend emerge in fashion that consists of ‘Imitation vs. Differentiation’. This remains a key driver in lifestyle, fashion and pop cultural trends today. Often we can track and observe, different societies influencing or inspiring each other through different cultures and with the transference of information this is inevitable. Because of this we see a high chase and flight pattern that has been adopted by retailers to help understand and know what to showcase to their consumers. The proverbial knowing what is ‘on trend’. Contemporary culture indicates a conspicuous counter-consumption occurrence. Classes are not so defined in what one wears, and early adopters, fashion leaders and innovators, have a heavy influence on what clothing is deemed on trend and fashionable for niche communities and particular fashion/lifestyle cultures. Fashion has started to manifest in a way where different sub-culture trends trickle to the ‘highbrow’ of fashion to street culture and vice-versa. This fashion exchange is happening both online and offline and during the age of the Internet and ‘call-out culture,’ it is evident that taking from a particular IP, cultural indicator or fashion item needs to be curated and executed carefully and respectfully. When celebrating a brand we need to understand the context in which it happens, as well as the intention behind a fashion brands re-appropriation. ‘Imitation vs. Differentiation’ has become heavily criticized within the fashion world with the consumers heightened sensitivities of cultural appropriation but a lessor known component is when it is not just the appropriation of an ethnic culture but an attitude, a religion, a way of life or your creative culture. What happens when your lifestyle becomes a fashion trend? From the crucifix, to gender fluidity it seems that nothing is beyond the fashion boundaries. Culture as fashion capital has moved beyond class and is evident in the ‘Trickle Theories’ in tandem. No longer are we pulling inspiration from the Gatekeepers, Media and Influencers but from the street and every day people. This is visible when we compare large retailers re-appropriating the cult skateboarding brand Thrasher, their logo and small businesses expressing homage to the brand. In our research at Nicola Cooper & Associates, we began investigating how the re-appropriation of the Thrasher logo is perceived within different sub-cultures. This was analysed after much disapproval and differentiating opinions had risen online. We proposed the question to discover what gives one fashion brand the permission to re-appropriate and another not? “There is a thin line between appropriation, celebration, inspiration and/or reference because it relies on attribution” say Luke Bell Doman from Corner Store in Cape Town. In larger, retail environments, “nothing is added to the story of the plagiarized brand, rather, potential customers are prevented from engaging with the real story because of large retailers fraudulent behaviour.” This ideology manifests itself within our everyday lives, if we recognize it at the time or if we don’t. Fashion has forever acted as an extension of a mindset, attitude, personal expression and a form of social commentary for people. So to really understand what the difference between differentiation and imitation is, we need to identify the intention behind the brand doing so. With the #BrandRevert trend manifesting, as well as living in an inter-connected world, we have seen the ‘return of the cult brand’ swiftly move into the fashion landscape. Leaders of this trend are brands such as Nike, Stussy and Supreme. The 90s are back and they have taken street culture and the catwalk by storm. On a global scale, we see collaborations with Rihanna x Puma Fenty on the runway of 2017 F/W PWF or Supreme and LV F/W 2017. We have noted that these trends influence consumer culture and trickle up, down and across sub-cultures or counter cultures alike. With the help of the internet and social media, it is not long before we see such trends influence the everyday consumers fueling the fashion cycle at international fashion weeks. We see this cycle repurpose and flow through the designs and styling of Gosha Rubchinsky and in retail observe a similar principle occurring with Forever 21, H&M and African retailer Mr. Price re-appropriating the Thrasher logo on mass-produced t-shirts and apparel, this happening only a few years after local brand, 2BOP, debuted their Thrasher ‘homage’ range. 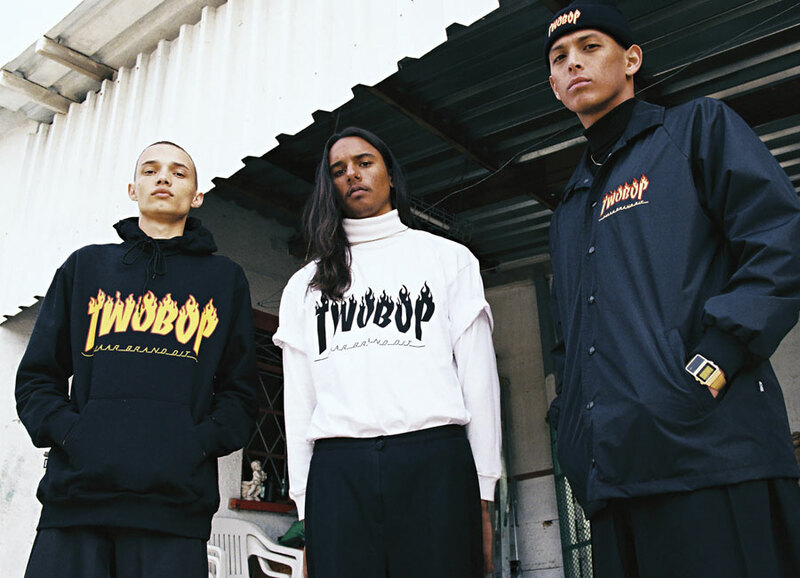 Consumers continue to call out larger retailers re-appropriating street and cultural logos as the intent of the re-appropriation is believed to influence the action. If large retailers intent is to showcase a logo without transparency and accreditation of origin, and those aware and invested of where particular street signage, message or logo originates a push-back from niche communities is expected but will it make a difference? Storytelling, authentic narrative, brand affiliation, and collaboration can influence the perception of your branding.